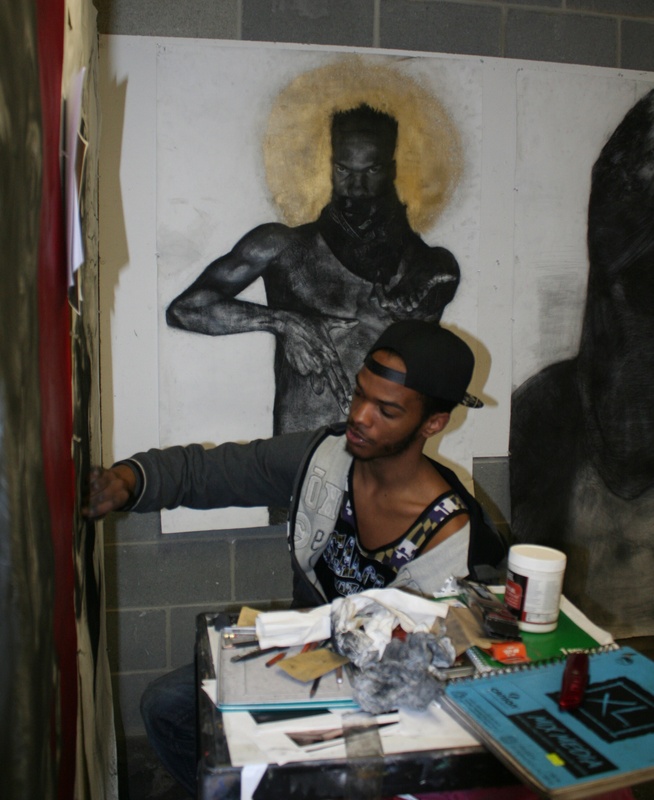 The seniors at PCA&D are immersed in the creation of their senior theses, the culmination of their BFA degree. 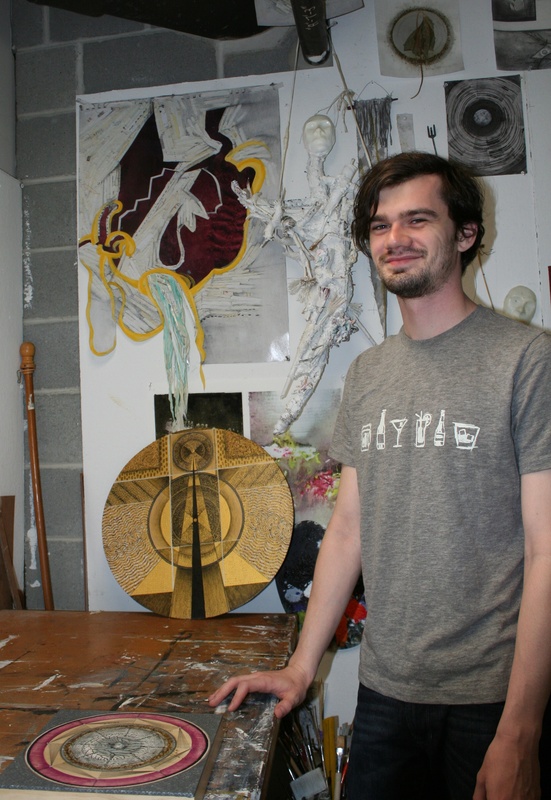 Each senior has his or her own studio space at PCA&D in which they create his or her thesis, which will be exhibited during the Senior Show and Celebration , Friday May 5, 5-8 p.m.
"The paintings I have created for my thesis utilize the basic geometric structure of the mandala and repetitious marks, especially dots, to create work that is contemplative and explore the therapeutic effects of art making. These paintings are artifacts of the changes in the conscious mind that occur when painting and studio practice is approached as a tangible tool for meditation. I'm looking for the intersection of art and the spiritual sciences,"
"We all share the same BLACK FACES." 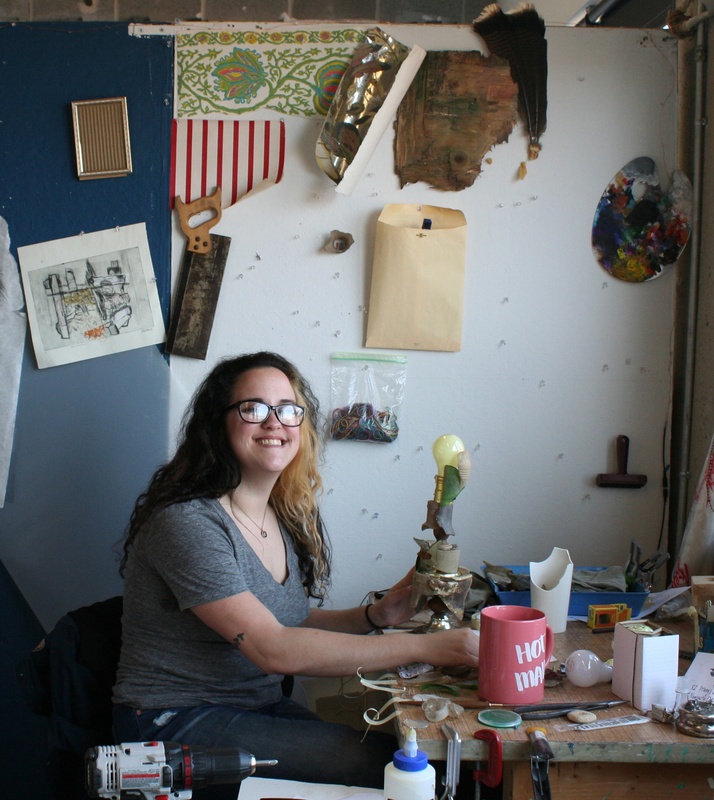 "My artwork focus on the idea of building work based off of quotes from her own personal journals. The subject matter varies from piece to piece but overall focuses on the idea of loss and absence of people." "The basis of my thesis is to re-create my grandmother's dining room from memory using found materials. The process of making this installation has been an offering to my family, our rituals, and a way to celebrate and explore my upbringing." 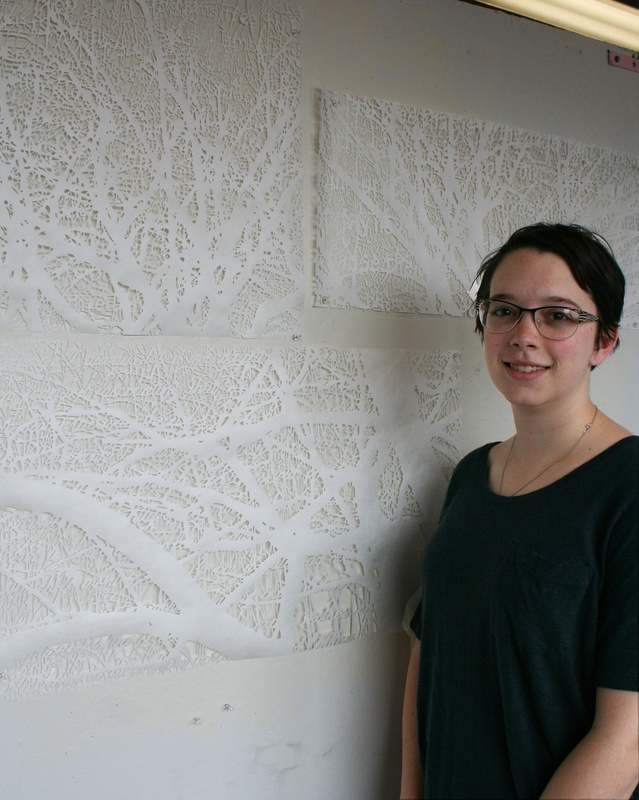 "My work is a mix of text, and tree patterns that I turn into very intricate paper cuttings on all white paper. The text in my pieces is based off of memories that I have that are specific to the tree it is layered with. In a way the tree acts as a symbol of a specific person in my life." "Art to me is about investigation and connection. The art I am making right now is heavily based in visceral emotion and the idea of freezing moments of mortality in ways that hopefully make the viewer think about their own mortality and the beauty of being in the moment." "An objective view of fragmented human figure is the base subject matter for all of my work. I am focussed on different positions that human anatomy is capable of, and finding ways to represent those segments of the body. I oil paint in thin layers as well as silkscreen on transparent fabric, and then use that fabric to create soft sculptures." 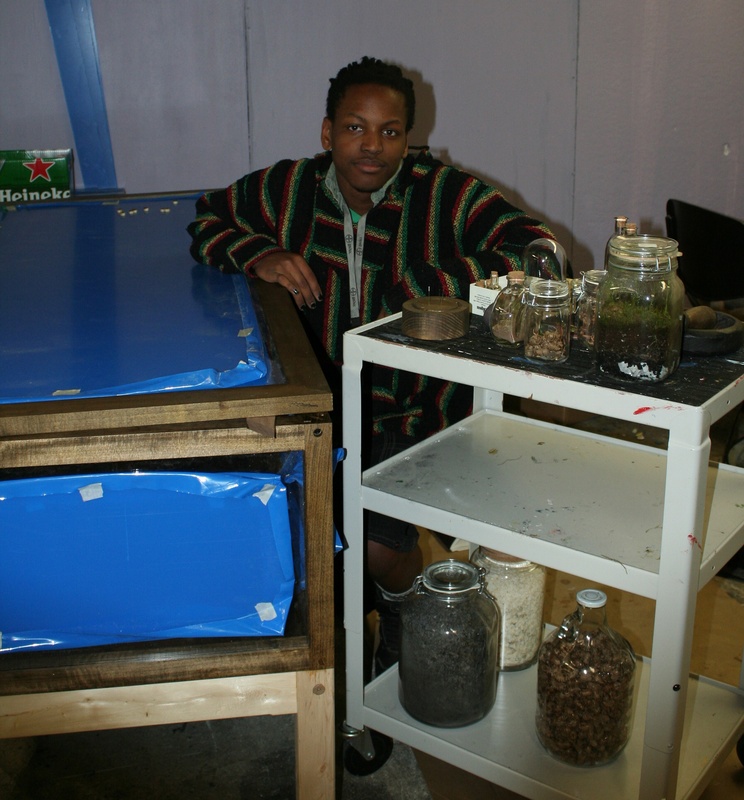 "My work is about materials and the process of making various things. I work mostly with recycled materials and transform them to be different objects completely. For my thesis, I was focusing on the concept of a fictional creature. 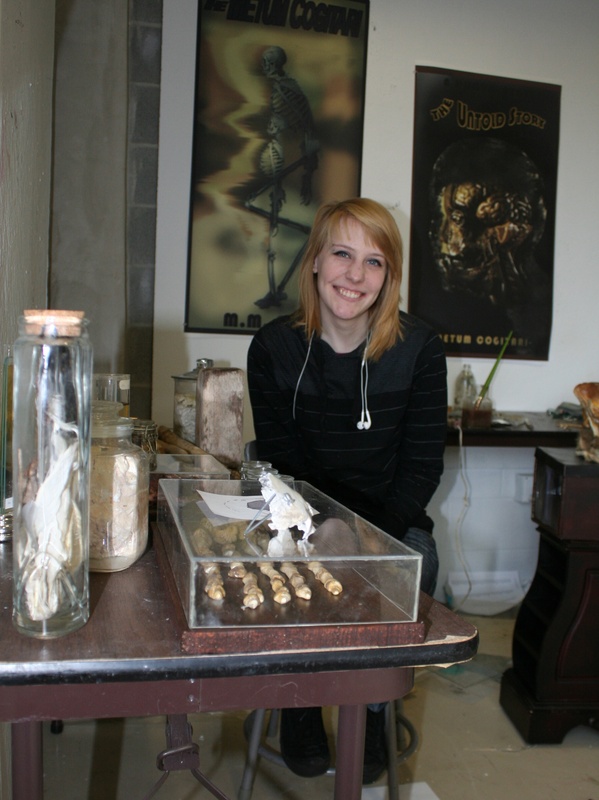 I used these found materials to create a miniature folklore museum that utilises fabricated specimens to allude to this creatures existence. The work is meant to play with the viewers psyche and make them question if it's real or fictional." 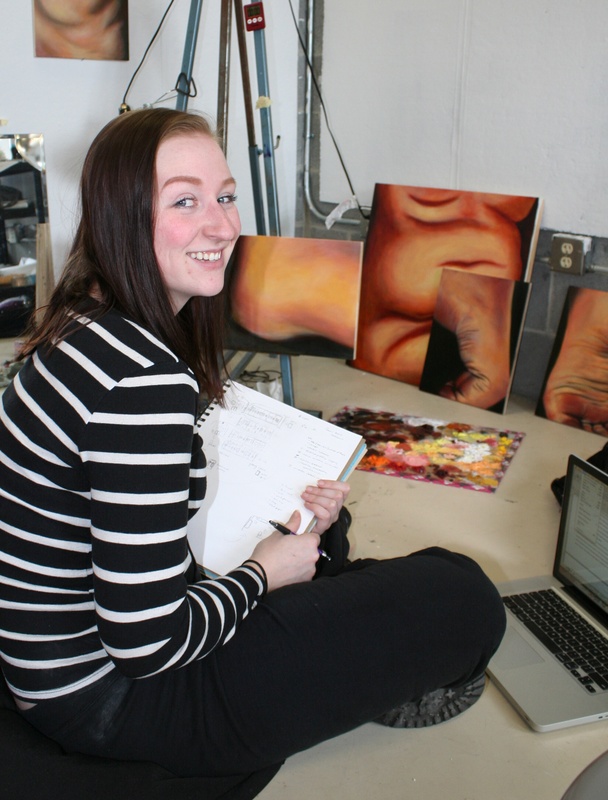 These senior thesis projects,the culminating work of PCA&D’s graduates in fine art, illustration, photography and graphic design, will be exhibited along with the projects of the graduating seniors in all the College's departments, at the Senior Show and Celebration on Friday May 5. 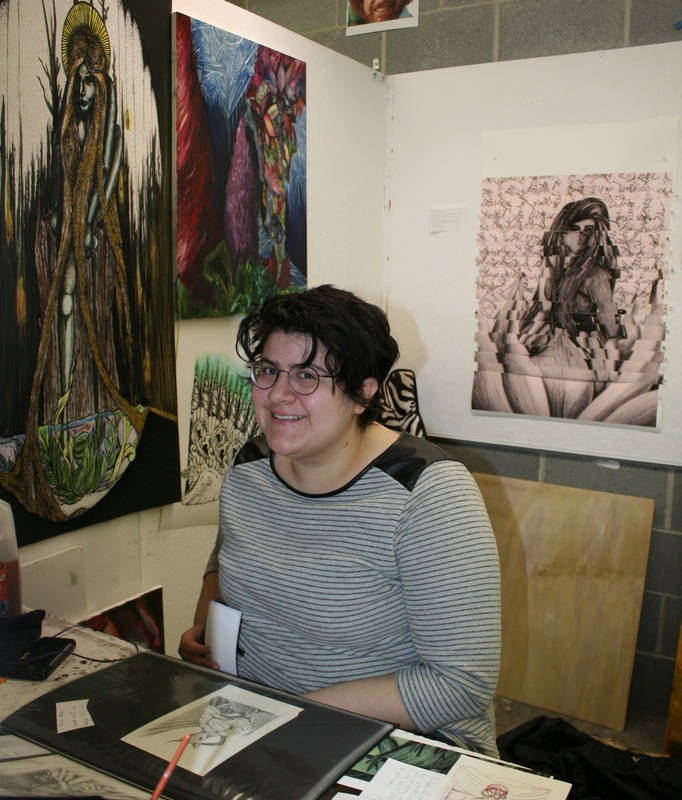 Following a Parent’s Preview, the College will open the Senior Show & Celebration to the public from 5 to 8 p.m. The public is invited to meet the artists, view the artwork and enjoy live music and refreshments. Many works are for sale. PCA&D’s annual celebration is the culmination of a day which begins with Commencement, when the BFA degree candidates in fine art, photography, graphic design and illustration graduate. From May 5-27, one work from each member of the Class of 2017 will be featured in the Main Gallery. Hours for the exhibit are Monday – Friday from 8 a.m. – 4:30 p.m. (closed Memorial Day).